See Kanshiro hirome tebikae for a look at Kanagaki Robun in Takahashi Katsuhiko's Kanshiro series. Kanagaki Robun (1829-1894) was one of the most important writers of both fiction and reportage in the late Edo and early Meiji periods. He was closely associated with sketch artists like Yoshiiku and also worked with Yoshitoshi. See Kanagaki Robun in the Who's Who in the Almanac section for more about him and his writing. 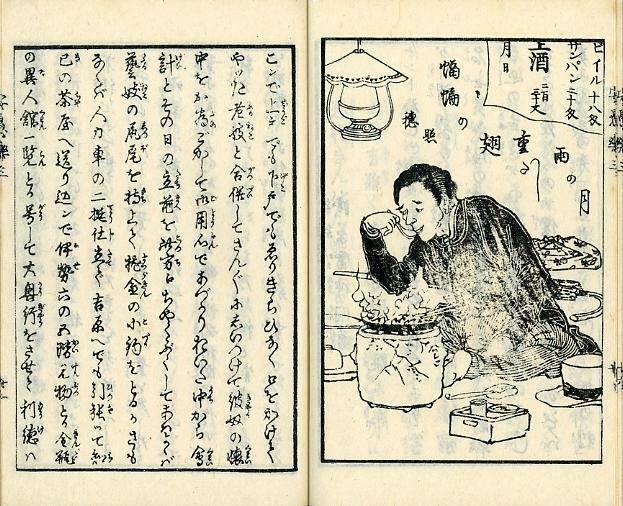 Kanagaki is best known for a collection of parodic stories called "Ushiya zōdan / Aguranabe" (牛店雑談 ／ 安愚楽鍋) or "Beef-shop small-talk: Cross-legged [at a beef] pot". The stories are humorous takes on people who flock to "beef shops" (牛店 ushiya, gy#363;ten) or "beef-pot shops" (牛鍋屋 gyūnabeya) to sit around pots of beef (牛鍋 gyūnabe, ushinabe), drink sake, smoke tobacco, and read the news or gossip. 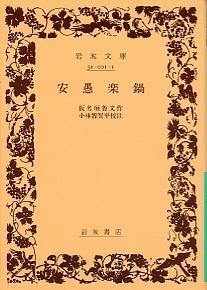 "Aguranabe", as the story is usually called, was published as three volumes (編) in five fascicles (冊). The first volume (one book) and second volume (two books) came out in 1871, and the third volume (two books) appeared in 1872. Here I will refer to the five books in three volumes as 1, 2a and 2b, and 3a and 3b. The word "agura" is usally graphed 胡坐 or 胡座 (both of which are read "koza" in Sino-Japanese) if not 胡床 (koshō). It derives from Japanese "a" meaning "foot" or "leg" and "kura" meaning a mount or platform on which one sat, usually while folding the legs and crossing the ankles. In time the word designating the seat became the term for the manner of sitting. The term "kura", which also means "saddle", is a suffix in a number of words, including -- possibly -- "makura" or "pillow" which seats or rides the head (atama). Why Robun graphed the word 安愚楽 (a-gu-ra) is a bit of a mystery. On the surface it is an example of the sort of visual wordplay that gesaku writers in particular loved. Here it might (according to some people) imply that sitting cross-legged at a pot of beef was "cheap, simple-minded, and pleasurable" way to put on airs of civilization and enlightenment. The story pokes fun at the rush to abandon the native in favor of the exotic -- particularly men who sit cross-legged before a steaming beef pot while drinking conventional sake and reading "news" (shinbun) in a newfangled "newspaper" (shinbunshi) For details on this important reference to the growing popularity of newspapers the very year Tokyo's first daily papers appeared, see On "nishikie shinbun". Aguranabe has been published in numerous editions, beginning with its original woodblock-printed booklets, followed by moveable-type editions, compact bunko editions, and now electronic text editions. In addition, there both printed facsimilies and electronic scans of early woodblock editions. Here I have used the Iwanami bunko edition to facilitate reading a paper facsimile edition, while also consulting high resolution color scans of a similar edition available on-line through the Old and Rare Materials Collection database at Waseda University Library. 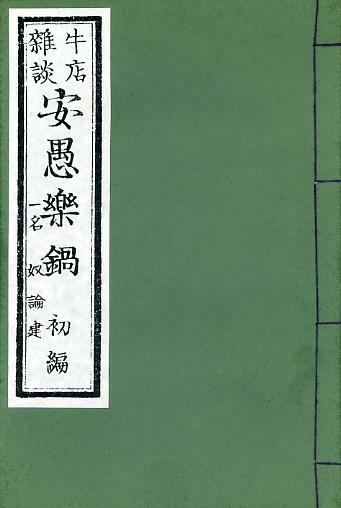 Aguranabe is most accessible in the following fully annotated and illustrated bunko edition of Kobayashi Chikahira's recension of the Seishidō text. Aguranabe was first published in five folio booklets by Seishidō in 1871-1872. 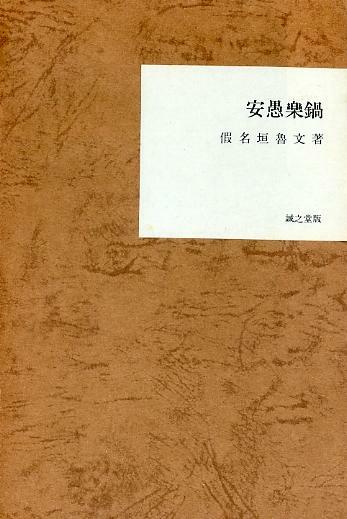 In December 1968, the Nihon Kindai Bungaku Kan (日本近代文学館) published a boxed facsimile edition of an early Seishidō printing of the booklets. Nihon Kindai Bungaku Kan calls itself "Museum of Modern Japanese Literature" in English though "kindai" means "recent-era" and refers especially to the Meiji, Taisho, and early Showa periods. According to a slip of paper accompanying the facsimile edition, the facsimile is faithful to the point of reproducing the ranchō (乱丁) or "confusion [of order] of leaves" in the source copy. Specifically, leaves 21-26 of Volume 3a (Book 1 of Volume 3) are misbound at the end of Volume 3b (Book 2 of Volume 3), while leaf 21 of Volume 3b is misbound at the end of Volume 3a. How many copies of the Volume 3 booklets were misbound is not known. Misbinding does not, however, seem to have characterized the early editions. Waseda University Library's Yanagida Izumi Bunko has one complete set (Volumes 1-3) and one partial set (Volume 2) of Aguranabe, and the leaves in its copies of 3a and 3b are not misbound. A decorative plate showing the title, and the names of the author or compliler, drawer, and publisher, is sometimes pasted inside the front cover. 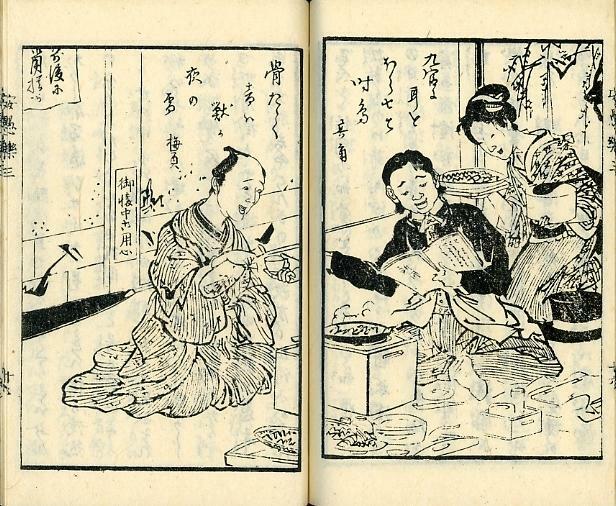 Only Volume 1 of the facsimile edition of Aguranabe shows such a plate, printed black-on-green. Note, also, that the publisher on the decorative plate, and the publisher on the opposing title page (1a), appear to be different. Three of the five books in the complete set in the Yanagida Izumi Bunko collection at Waseda University Library -- Volumes 2a, 3a, and 3b -- have decorative title plates inside the front cover. The plate in the facsimile edition resembles the plate in Volume 3b of the Waseda set in both its design and particulars. All books in the the facsimile set have green covers. The first four books of the complete Yanagida (Waseda) set have green covers, while only the last book (Volume 3b) has a brown cover. The covers of the both books (Volumes 2a and 2b) in the incomplete Yanagida set are brown or tan. 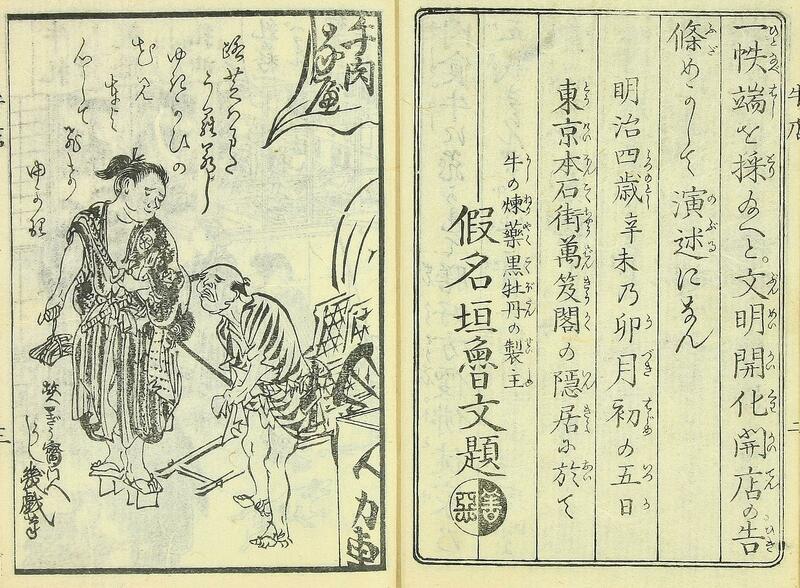 Bankūkaku, a Tokyo woodblock printer and bookseller, was also, at the time, publishing Kanagaki's comic saga Seiyō dōchū hizakurige (西洋道中膝栗毛). This work, begun in 1870, ran to 15 volumes in 30 fascicles (booklets) when finished in 1876. The final volumes, 12-15, are attributed to Kanagaki's friend, the gesaku writer Fusō Kan (総生寛 1841-1894), signing as "Misugi Yosugi Fusō Kan" (七杉子総生寛). Apparently Book 2 of Volume 6 of "Hazakurige" published an excerpt from "Aguranabe" by way of promoting the forthcoming work, but the excerpt never appeared in the finished version (Kobayashi in Kanagaki 1997:6). doronken (奴論建) is a transliteration of ドロンケン from Dutch "dronken" meaning "drunk". This word, also written ドリンケン (dorinken) and トリンケン (torinken), appears to have been part of the port lingo of the time (Kojien). The characters Kanagaki used to represent the word could be taken to mean "construction of debate by slaves/servants". Tokei reflects the furigana provided for 東京 at the end of the preface (see below) and elsewhere. It would be several years before the name of the city was standardized as Tōkyō. black botan reflects 黒牡丹 (kurobotan, kokubotan) -- a dark purple peony. Here the expression is cant for cow, steer, or water buffalo. The decorate plate inside the front cover of the facsimile edition attributes the drawings to Shōjō Kyōsai (猩々暁齋畫). While some descriptions of Aguranabe -- including Kobayashi's (Kanagaki 1997:8) -- state that Yoshiiku was the illustrator, several pictures bear one or another of Kawanabe Kyosai's signatures. However, Yoshiiku was clearly a principal illustrator. 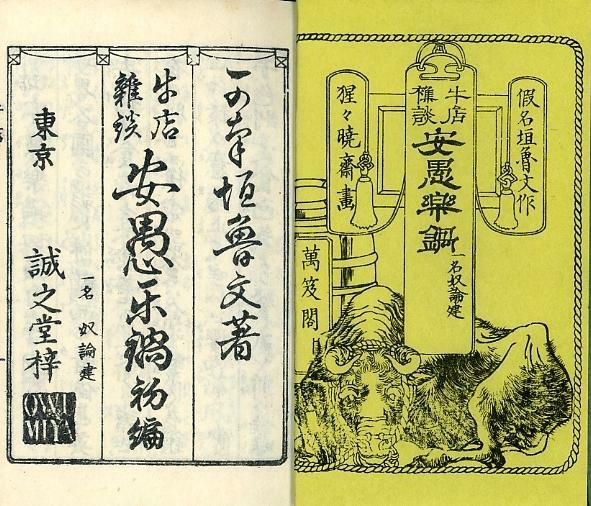 The left column of the tripart title page of the facsimile edition shows first (right) the subtitle "Ichimyō Doronken" and the second (left) the city and publishing company "Tōkei Seishidō shi" and a seal reading "OWU / MIYA" (Ōmiya). The hand is clearly different from that of the columns for the author's name and the main title. The left column of the title page on the Yanagida Izumi Bunko copy in Wasuda University Library, however, shows only the subtitle "Ichimyō Doronken" -- in larger script, laterally centered, justified at the bottom with the main title in the adjacent column -- and in the same hand. While the facsimile edition has only one decorative title plate, the set of booklets in the Yanagida collection at Waseda has three different plates, as follows. 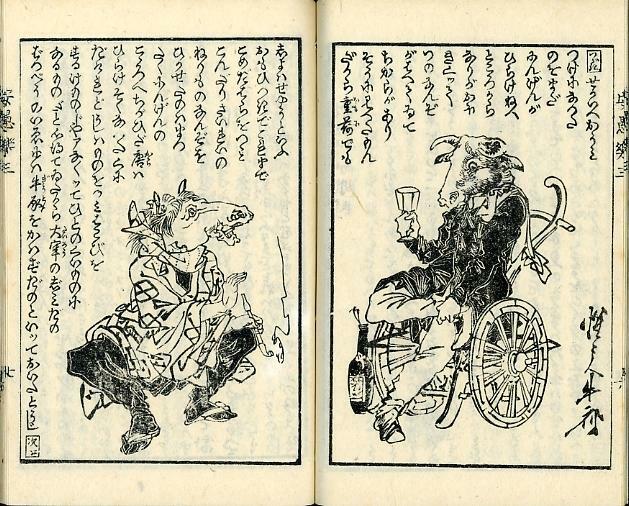 Yoshiiku's deceased mentor, Kuniyoshi (國芳 1798-1861), known also as "Ichiyūsai" (一勇斎), has been reborn a cow (ぎう giu > > ぎゅう > 牛 < ushi), of higher status than a mere sketcher of playful pictures. Most of Kuniyoshi's students had such names. Yoshiiku was Ikkeisai or Keisai, and Yoshitoshi was Ikkaisai or Kaisai. Kawanabe, who also originally studied under Kuniyoshi, was first 狂斎 and then 暁斎, both of which are read Kyōsai. 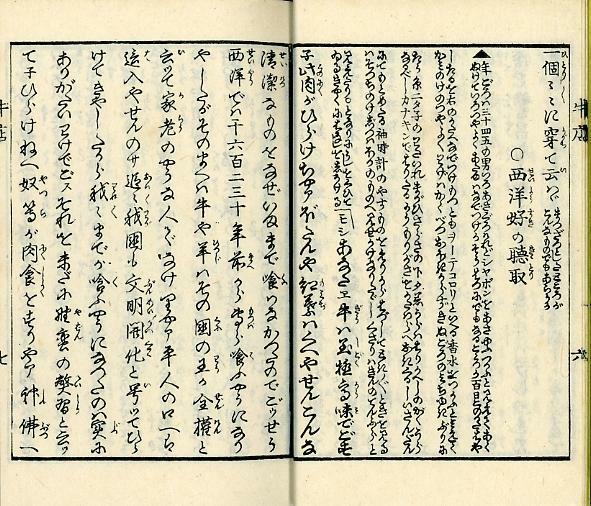 Aguranabe begins with a four-page preface which Kanagaki dates, signs, and seals like this (Volume 1: 2b). Kanagaki appears to be practically living at Bankyūkoku, the Tokyo woodblock printer and bookseller which was publishing another of his stories (see above). The seal reads, right to left, white 善 (zen, "good") on black, black 悪 (aku, "evil") on white. Kanagaki was known for using a seal that read 善 in white and 悪 in vermilion -- when using cinnabar ink. The preface is printed with a woodblock that would have been cut from a sheet of paper on which Kanagaki had brushed the text and affixed his seal -- with cinnabar ink. The red parts of the seal are thus printed as black. Both copies of the first book of Volume 2 in Waseda's Yanagida Bunko credit Keisai Yoshiiku with the drawings, and indeed his hand is seen in a number of the illustrations in Aguranabe. The kuchie or "frontispiece" following Kanagaki's preface in Volume 1 (is clearly signed by Yoshiiku -- in a manner that exemplifies his well-known sense of humor (Volume 1: 3a). A young man who likes the west sits cross-legged at a beef pot simmering over coals in a hibachi. He holds a cut of sake in one hand while spooning beef broth with the other. A pipe and smoking box sit on the floor. The menu in the upper right reads as follows. Note: 60 momme = 4000 mon. Horse: You've come up in the world. Cow: Yeah, but they're going to eat me. Horse: You'll be reborn a higher animal. The graphic transcription, including the furigana, reflects the text in the Kindai Bungaku Kan facsimile edition of the Seishidō fascicle edition (1968, Volume 1, 6a-10a). The punctuation, however, is based on the Iwanami Shoten bunko edition (5th printing, 1997, pages 28-29), which also informed some of the commentary. Furigana are shown in (small parentheses) following the graphs they appeared beside in the facscimile edition. The bold emphasis for purposes of commentary is mine (Wetherall). Both the structural translation and the commentary are mine mine (Wetherall). A man some thirty four or five in years, his color [complexion] was light black, but he appears to use soap mornings and evenings, [as] the grime is gone and the luster of his color [complextion] is good . . . .
"Hello there. Beef is extremely delicious, no? When this meat spreads, we won't be able to eat peony or maple leaves. Why until now haven't we eaten anything so clean? In the west [western sea], [people] came to mainly eat [beef] from one-thousand six-hundred and twenty or thirty years ago, and before that, beef and mutton -- if one wasn't the king of the country, or someone like a house elder, involking complete authority -- never entered [crept toward and into] the mouths of ordinary people. Step by step [in] our country too, in the name of civilization and enlightenment, [beef] has come to spread, so even we have come to eat [it], a truly thankful situation. spreads reflects ひらけちゃア (hirakechaa < hirakete wa) -- opens out, unfolds, progresses, develops, blossoms -- said of roads, civilization, opportunity, hope, computer files, even flowers. This resonates not only with the flowerful metaphors for venison and wild boar, but also with the later phrasing -- "step by step . . . in the name of civilization and enlightement, [beef] has come to spread" (追々 . . . 文明開化と號ツて、ひらけてきやした bunmei kaika to itte, hirakete kiyashita). Note that "step by step [gradually] spreading" (追々開け oioi hirake) was a common expression, found also in TNS-876. peony and maple leaves reflects ぼたんや紅葉 (牡丹や紅葉 botan ya momiji) == "boar meat (猪肉 shishiniku) and deer meat (鹿肉 shikaniku). The term "beef pot" (牛鍋 gyū nabe) was inspired by expressions like "boar pot" (牡丹鍋 botan nabe, 猪鍋 inoshishi nabe) and "venison pot" (紅葉鍋 momiji nabe). Another oblique reference to boar -- to get around prohibitions and taboos about eating meat -- was "mountain whale" (山鯨 yamakurjira). Similarly, horse flesh for human consumption was (and still is) called "cherry blossoms" (桜 sakura). Horse meat sashimi is just "sakura" and a "horse meat pot" is "sakura nabe" (桜鍋). During the Tokugawa period, farmers around Edo would shoot boar and deer as pests, and ship them to shops in Edo called "momonjiya" (ももんじ屋) among other names. People would cook such meat in iron pots, much like sukiyaki today, or on iron plates like teppanyaki. clean reflects 清潔な (seiketsu-na) -- as opposed to being dirty (穢れる kegareru) in the sense of being defiled, polluted, soiled, impure, unclean. house elder reflects 家老 (kaō), the highest ranking (chief) retainers serving the lord of a domain. ordinary people reflects 平人 (hirabito, heijin, heinin). Between 1869 and 1871, shortly before Robun wrote this, Tokugawa laws concerning status were revamped or abbrogated, so that formal distinctions between warriors, farmers, craftsmen, merchants, and outcastes were generally reduced to "samurai descendants" (士族 shizoku), meaning disenfranchised, hence former, samurai -- "ordinary folk" (平民 heimin), meaning ordinary or common people -- in addition to members of the imperial family and the titled nobility.